Welcome to Salon 808, Topeka’s finest salon. 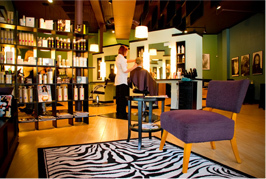 Salon 808 offers its customers a full array of salon services, the finest stylists, and a commitment to personalized attention. Salon 808 is located in The Devon, a gorgeous historic prairie style building dating from 1887. You will find us on the west corner of the ground level, in a space that was originally used as a grocery market until the mid 1980s. The east corner of the ground floor was a drugstore from 1906 to 1959, and today is home to our neighbor, Cafe’ Holliday. Salon 808 is proud to call The Devon home. 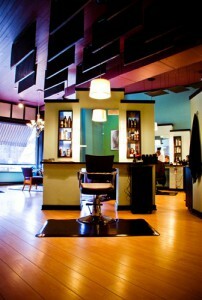 A distinctive Salon in a distinct landmark in a distinct historic neighborhood. Topeka contractor Henry Bennett built the first “apartment” house on this site in 1887-8, calling it “Bennett’s Flats.” Then in 1906 prominent attorney and businessman James W. Gleed remodeled it, among other alterations changing the attic into a full 3rd floor and refacing the facade into its present Prairie Style character of broad horizontal lines and arched openings. Each of the some 20 apartments are unique, some with pocket or French doors, plus hardwood floors and distinctive wood trim and moldings; open staircases “spiral” to the top floor.